Saturday, 17 June 2017 - Stage 8 in the Tour de Suisse is a hilly criterium of exactly 100 kilometres. The route takes in eight 12.5 kilometres laps, while every round features two climbs - the longest 1.2 kilometre at 4.6%. 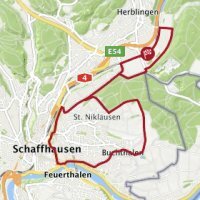 The criterium in the penultimate stage of the Tour de Suisse is played out in Schaffhausen, close to the German border. The town is famous for the nearby Rhine Falls, which is the largest waterfall in Europe. In the 2011 Tour de Suisse a young Peter Sagan sprinted to victory in Schaffhausen ahead of Matthew Goss and Ben Swift. Following a flat opener of 4.3 kilometres each round takes in one KOM-climb. The 1.2 kilometre climb is averaging 4.6% and once above another slight ascent takes the riders to 471 metres above sea level, which is the highest point in the route. A plunge down and in 2 kilometres another lap is completed. Each round brings 133 vertical metres to the table. Since the circuit is ridden eight times the race amounts to 1,064 climbing metres. Three intermediate sprints – at kilometre 67.2, at kilometre 79.7, and at kilometre 92.2; so in the fifth, sixth and seventh lap – bring time bonuses of 3, 2 and 1 seconds. The first three riders on the line take 10, 6 and 4 seconds. Read also: results/race report 8th stage 2017 Tour de Suisse.